Rich deep shades of autumn create a star set against gentle earthy beige tones. 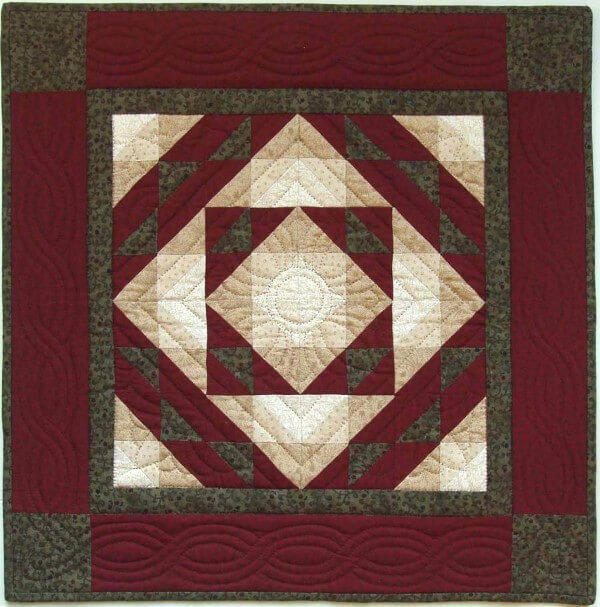 A feathered quilting design overlays the star and a flowing cable wraps the border. Turn the patches another way and create two equally beautiful variations for this pattern Autumn Diamond or Geese in Flight. Finished size is 22in x 22in. Complete kit for the Autumn Star Wall Quilt from Rachels of Greenfield. Turn the patches another way and create two equally beautiful variations for this pattern - Autumn Diamond or Geese in Flight. Colors are deep red, green, and beiges ranging from cream to paper bag.